1943. The Vilna Ghetto is about to be liquidated when Major Karl Plagge, a Nazi officer chooses to risk his own life to save the lives if Vilna's Jews. Plagge's heroism was relatively unknown until Dr. Michael Good sought out Professor Richard Freund to tell him a miraculous story of the Holocaust known by very few people. Professor Freund is the Director of the Maurice Greenberg Center for Judaic Studies and Greenberg Professor of Jewish History at the University of Hartford, in Hartford, Connecticut. This is the story of Plagge, of the people he tried but failed to rescue, and of the hundreds of people who he saved. 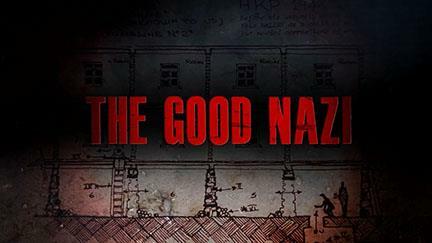 The Good Nazi explores how Plagge, while acting as the commandant of a forced labor camp, sheltered hundreds of Jewish families. Today, the former “HKP” – unchanged! – is home to impoverished Lithuanians. Because the government is about to tear down the site and put up condos instead, a group of scientists arrives to locate the hiding places of those that were saved and identify the mass grave of those who were murdered. A child survivor of the camp and an American physician, whose mother was saved by Major Plagge, join them. The film tracks their three stories and, ultimately, brings to light the unknown tale of a Schindler-type German who listened to his conscience, instead of his superiors. Dr. Freund, the lead archaeologist on the Vilnius temple project will give us the back story on the work that reveals the story of the “Schindler of Lithuania” Major Karl Plagge with writer Michael Good. Dr. Richard A. Freund is the Maurice Greenberg Professor of Jewish History and Director of the Maurice Greenberg Center for Judaic Studies at the University of Hartford. Professor Freund has directed over a dozen archaeological projects on behalf of the University of Hartford in Israel, including sites associated with the beginnings of Christianity and Judaism at Nazareth, Bethsaida, and Qumran, site of the discovery of the Dead Sea Scrolls. In addition, he has directed projects on behalf of the University of Hartford in Spain (2 sites), Poland (3 sites), Rhodes, Greece (four sites) and Lithuania (15 sites in Lithuania). His work has been featured in the New York Times, Time magazine, Reader’s Digest, Newsweek, Archaeology, two major articles in Smithsonian magazine and featured on the BBC, MSNBC, CNN, NPR and Fox News and in hundreds of media outlets worldwide. His work is featured in 20 television documentaries from National Geographic, CNN, Discovery, History Channel and PBS. His most recent work in Lithuania has been chronicled in a recent NOVA science series episode: “Holocaust Escape Tunnel” on the new discoveries made in the Ponar Burial Pits and the Great Synagogue of Vilna, Lithuania that has been seen around the world. Dr. Freund is the author of over 100 scholarly articles and ten books (written or co-edited) including his most recent book Digging through History (Rowman & Littlefield, 2012; paperback 2016). In spring, 2019 his new book: Archaeology of the Holocaust: Vilna, Rhodes, and Escape Tunnels (Rowman & Littlefield, 2019) will be published.